The new horse barn at the Champaign County Fair nears completion. 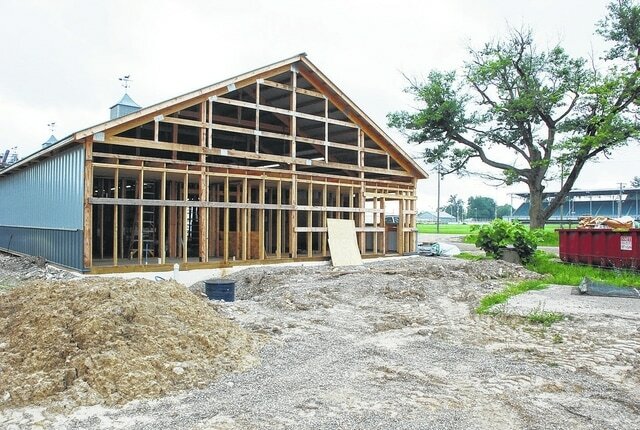 The new horse barn at the Champaign County Fair is expected to be finished and ready for occupancy by the start of the fair this year. A new horse barn being constructed on the north end of the Champaign County Fairgrounds should be open for use by the start of this year’s fair. Fair Board Director and Race Secretary Randy Leopard said the barn was near completion in early July, with a goal of opening a couple of weeks before the start of fair. This year’s Champaign County Fair is Aug. 7-14. The fair board decided to build the new 40-by-200-foot barn, north of the race track between the current barns and the Champaign County Animal Shelter, because all the other race horse barns were full. The construction cost the fair board just about $250,000, which will be generated by leasing the barn to the Jim “Bill” Dailey Stable. The way the barn is constructed will leave room for having another barn built in the future, Leopard said. The new barn increases the space available for horses from 100 to 130. And all spaces will be full once it’s open, Leopard said. The barn construction was done by local contractors, Leopard said. Since the contractors were in the community, they all understood the importance of getting the barn finished and up and running by fair. To build the new barn, some temporary stalls needed to be removed. That required the barn be open for fair time. Leopard said the barn is a good investment, not only because it will be paid for by the leasing arrangement, but that it will be needed as racinos continue to expand in Ohio. State lawmakers legalized video lottery terminals at the four commercial race tracks in the area, which increases interest in harness racing, Leopard said previously. As part of that agreement, horsemen get a portion of the total proceeds to fund race purses. Champaign County’s fairgrounds are located within an hour of three racinos – Scioto Downs in Columbus, Miami Valley Gaming & Racing in Lebanon, and Hollywood Gaming at the Dayton Raceway in Dayton.